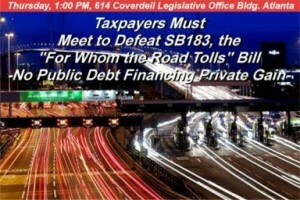 The people of Georgia must show up in strength to defeat #SB183 the “For Whom the Road Tolls” bill. The Governor’s bill proposes the State of Georgia to loan private parties moneys out of taxpayer funds, AT RISK, to build and operate unlimited numbers of toll roads all throughout the state, and for these private concessionaires to collect tolls in perpetuity, even after the state loans are paid off. The people need to show up and stand against the crony-capitalist exploitation of the Georgia Taxpayer. Section 3 legalizes permanent toll roads in Georgia. Section 3 allows mandatory tolls to be imposed on Georgia roads in the same manner as implemented in states like New Jersey and Florida. It also allows tolls to be placed on existing road capacity. 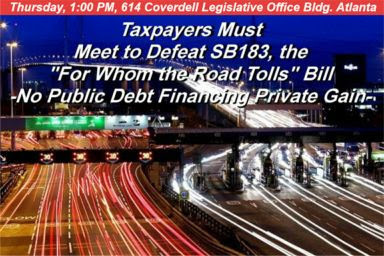 If you can’t attend in person, please call the committee members and let them know how you feel about the state loaning money to private corporations and tolls in perpetuity. P.S. Please forward to your lists and share/tweet on social media. We issue this “Pink Slip” as a written form of termination for poor performance. Copies of the “Pink Slip” will be sent to taxpayers and voters throughout the 4th District and made part of your personnel file. Your neglect to attend community meetings and debates, answer citizens’ concerns, provide strict oversight of departments, dishonesty and divisiveness are signs that indicated an overall disrespect for the 4th District constituency. Since it is our vote that hires and fires elected officials and our tax money that pays elected officials salaries, we (the people of the 4th District) are the “employers” and you are the “employee”. In the name of moving our district in a new direction with a new vision, we must advise you that after two terms…your performance is poor and we are looking for new leadership. Where’s the $70 Million Dollars that’s Missing from Watershed? 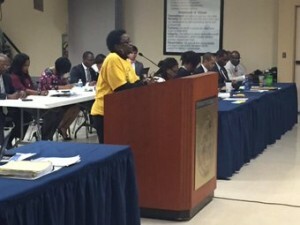 The DeKalb County LSBE vendors voted to make the information public that we gave to law enforcement. The LSBE vendors were very upset that DA James proclaimed that there was no need to investigate issues/people concerning the grand jury report, particularly in the Watershed Department. We are forwarding information on one particular contract for $1.4 million dollars (Public Works contract). After submitting an Open Records Request and receiving Kelvin Walton’s emails, our researchers went through (and continue to go through) over 20,000 emails and hundreds of attachments. We found an attachment that provided the amount of money paid out on different contracts. The contract for $1.4 million paid out over $72 million dollars. Please note that this is the same contract that the FBI indicted two county employees for extortion and bribery in 2012. I, Viola Davis, personally spoke to the contractor, and he said he did receive the $1.4 million dollars. However, he did not know anything about the $72 million. Our question is, who received the money? We ask that you review the documents we delivered to District Attorney Robert James. We did not deliver the attachment of documents that involve the $72 million dollars because of the lack of action on former documents presented to the District Attorney’s Office. We are presenting these documents to the public to review and decide if there is enough information to demand action and another outside third party review for criminal activity. 1)	Failure to properly preserve government records in violation of the Georgia Records Act O.C.G.A. 50-18-90 et seq. and 22A (c) (7) of the Ethics Code (Engaging in an activity prohibited by law). Specifically, failure to maintain purchase card receipts. 2)	Theft by taking, theft by deception, false certification by employee, making a false statement in violation of O.C.G.A 16-8-3, 16-10-9 and 16-10-20 and 22A (c ) (7) of the Ethics Code (Engaging in an activity prohibited by law). Specifically, purchase of gift cards with County funds for personal use, improper purchase of personal items on government issued purchasing card without reimbursement to the County in many cases. 3)	Theft by deception, false certification by employee, making a false statement in violation of O.C.G.A. 16-10-3, 16-10-8 and 16-10-21 (b) and 22A (c) (7) of the Ethics Code (Engaging in an activity prohibited by law). Specifically, use of County time to attend political event. 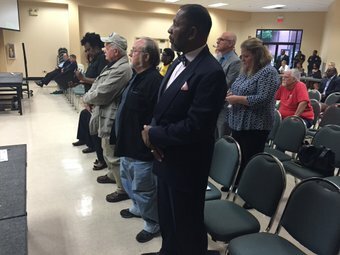 Unhappy Taxpayer & Voter and Restore DeKalb continue to be victorious in holding elected officials and government staff accountable for violating the public’s trust. We originally filed our complaint against Commissioner Sharon Barnes Sutton and Judy Brownlee on May 30, 2014. We have waited patiently for nearly two years for justice. We presented an earlier ethics complaint against Commissioner Sharon Barnes Sutton and Judy Brownlee to the DeKalb County Board of Ethics that was well documented and showed Barnes Sutton and Brownlee violated codes within Section 22A (c) (1-7) of the DeKalb County Code of Ordinances known as the Code of Ethics, as well as violation of state statutes. Unfortunately, Barnes Sutton filed a lawsuit against the Board of Ethics proclaiming the board was unconstitutional. 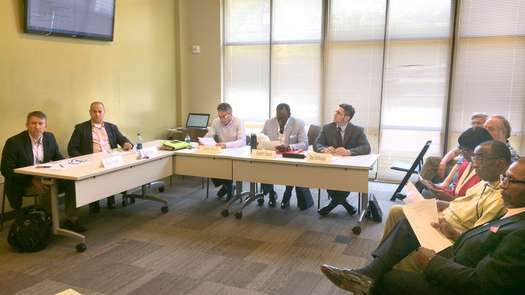 She questioned the authority of the board to sit in judgment of officials’ behavior, arguing that it undermines the fundamental due process rights. 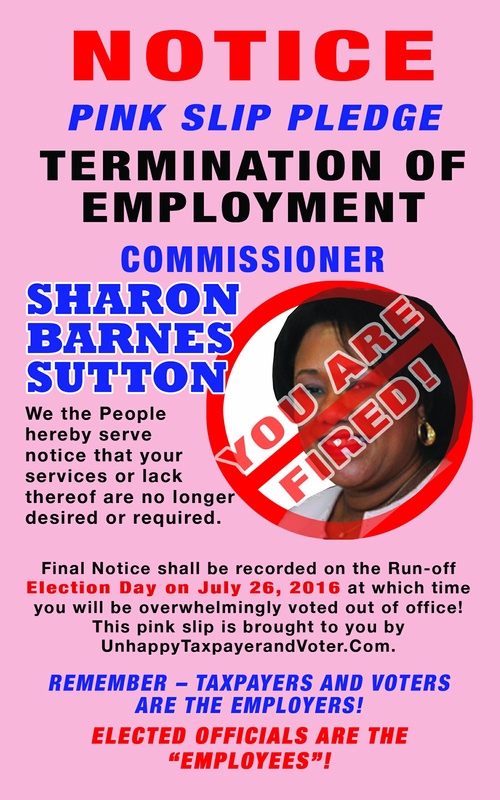 Despite DeKalb voters approving the new ethics law by 92% back in November of 2015, Sharon Barnes Sutton delayed the ethics board hearings which ultimately denied the public justice. On February 9, 2016, Unhappy Taxpayer and Voter and Restore DeKalb requested the appointment of a Special Prosecutor and expansion of the Public Integrity Unit to help restore public trust. We initially submitted our request to the DeKalb County Board of Ethics concerning our ethics complaint against Commissioner Sharon Barnes Sutton and Judy Brownlee due to our strong belief that the charges were criminal in nature. 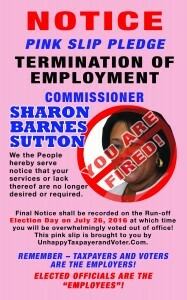 However, Commissioner Sharon Barnes Sutton has chosen to sue the DeKalb County Board of Ethics as a delay tactic. We questioned the reason Commissioner Barnes Sutton waited until her final hearing (approximately 1 ½ years) to initiate her lawsuit. 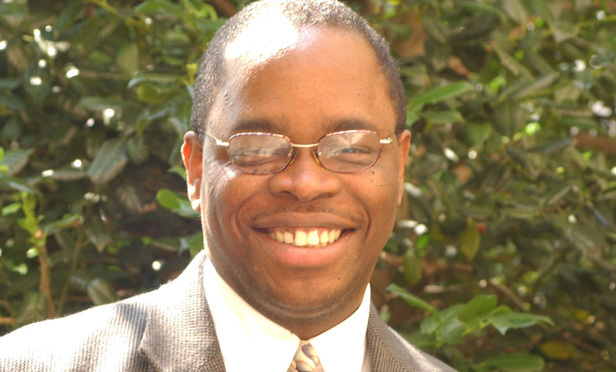 a.	Burrell Ellis, former CEO of DeKalb County, was charged with 15 felony counts in his initial indictment in 2013.
b. The initial indictment included theft by taking, criminal attempt to commit false statements and writings, and coercion of other employee to give anything of value for political purposes. 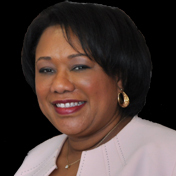 a.	Clarissa Brown, former executive assistant to DA Robert James, received a ten count felony indictment for stealing on purchase cards. i.	Gwinnett case number 15-FT-00594-8 (Quasi – Fast Track Case) was filed two years after Brown was fired approximately December 29, 2015.
ii. Brown pleaded guilty January 2016.
c.	Clarissa Brown was fired from her position after the violations were discovered and DA Robert James requested a special prosecutor. d.	Clarissa Brown pleaded to ten counts of felony for theft by taking, etc. e.	Brown pleaded guilty to using her government charge card for car repairs, property taxes and plane tickets. a.	Bod Lundsten was indicted with nine counts of felony in 2014-2015.
b. Bob Lundsten’s indictment was for as little as $300.00 despite his repayment of prior questionable charges. c.	Bob Lundsten was originally charged with six counts of theft by taking and three counts of making false statements. d.	The charges against Bob Lundsten were decreased to misdemeanors in an out of court settlement. e.	Under an agreement with prosecutors, Lundsten pleaded guilty to three counts of misdemeanor obstruction. a.	Stan Watson was accused of Driving Under the Influence (DUI) after an altercation against two women in a local club. b.	Stan Watson was videotaped by local police and a police report was written that provided serious accusations of DUI. c.	Solicitor General Sherry Boston requested a special prosecutor to intervene to review Stan Watson’s case for prosecution. We submit that the charges voted on by the DeKalb County Board of Ethics involve violations of state statutes. We believe that our ethics complaint rises to criminal charges. These criminal charges must be address by both our District Attorney and Solicitor General to “truly” restore the public’s trust and remind everyone that laws are enforced “equally”. We are forwarding the complaint with supporting documentation from the Board of Ethics to both departments to examine for prosecution. If these charges create a conflict of interest situation, Unhappy Taxpayer and Voter and Restore DeKalb are once again requesting the appointment of a Special Prosecutor. We request the prosecution of Judy Brownlee because new evidence, documentation and witnesses have come forth to prove the code of ethics and the “state laws” were violated. The additional information proved that the actions of a select group of elected officials and top administrators undermined the law to the point that the ethics case against Judy Brownlee would need to be forwarded to the District Attorney and Solicitor General for prosecution. The serious complaints against Judy Brownlee are presented for the purposes of requesting these issues move forward. Thus far, we have presented complaints that have enough evidence to warrant criminal investigations. We have presented complaints that are factual, well researched and command results. There are those who claim we must end these cases for the county to move forward. However, how can we end cases that have never “really been open”. Our request for the prosecution of Judy Brownlee must be addressed by the District Attorney and/or Solicitor General to ensure justice. We request equal justice under the law. We ask for an appointment of a Special Prosecutor by Attorney General Sam Olens if anyone views such actions as a conflict of interest.